K1long variants on the standard bind off. My Ravelry friend Catnach (Jennifer) was intrigued by the k1long technique, and decided to try using it as an increase to improve some of her silk laceweight bind-offs on lace shawls. I liked the result so much that I thought I’d share it with you. knit 1, then pass the previous stitch over. 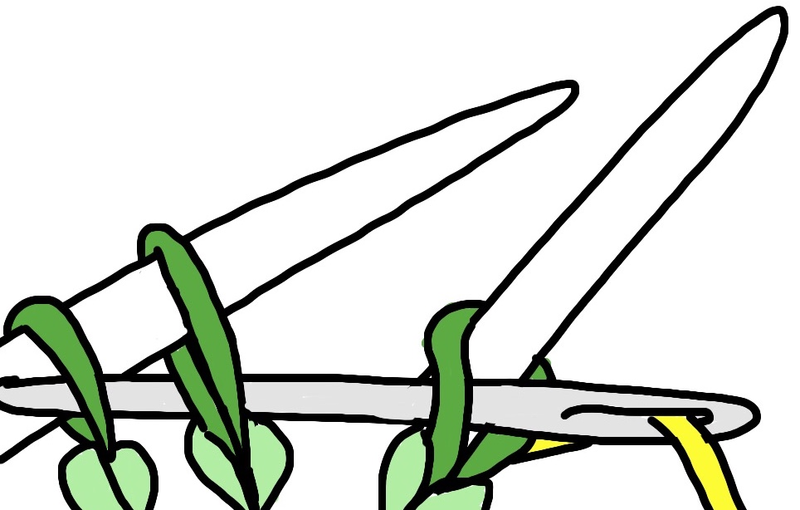 It’s beautifully straightforward, but has one major disadvantage: it’s not very stretchy. One easy way to deal with this is to increase more stitches in the final row or two. Catnach’s photo, used with permission. 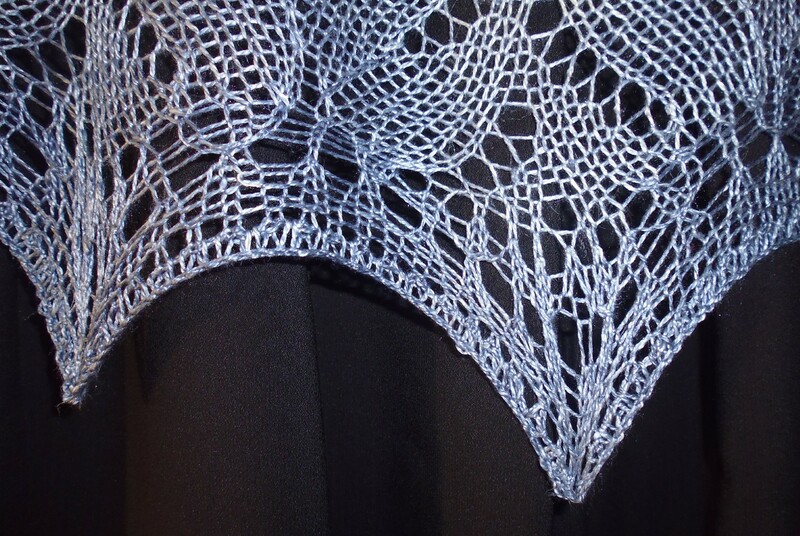 Jennifer was working a lace shawl with a plain garter edge, and so in the final right-side row, she increased a stitch between every regular stitch by working a k1long between them. (Link goes to her notes on Ravelry; an account is required to see the details.) It’s the most straightforward sort of k1long, sometimes referred to as m1, though it’s not the stitch that’s usually given that name: pick up the bar between two stitches and knit it without twisting. She then bound off on the wrong side row in the usual fashion, knitting the stitches as she went instead of purling. Since there were almost twice as many stitches in the row, there was sufficient length for the bind-off when the lace was stretched in blocking. It makes a nice crochet-like edging. I wouldn’t recommend this as a bind-off for anything but an edge on lace, where the extra length is helpful. As you can see in this swatchlet, it will make the bind-off curve or ruffle with plain knitting. Of course I had to play around some more once my interest had been piqued. Here is another variant. 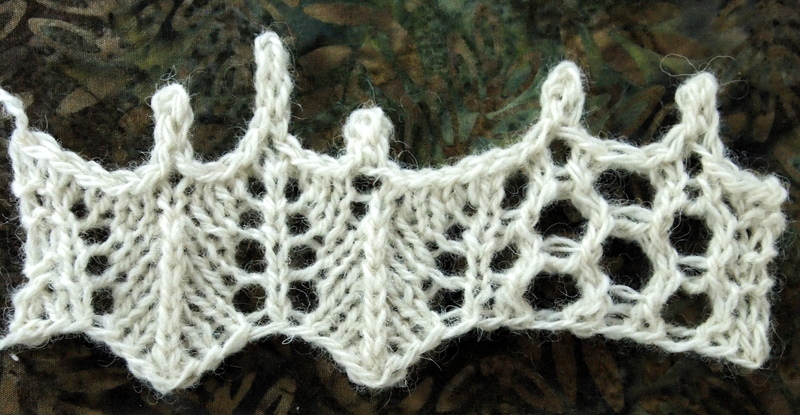 I worked a lace row, then a plain wrong-side row, and then worked k1long stitches in the same row as the bind-off. In this case, I worked the k1long by skipping down two rows between the regular stitches, which for this pattern means that I was knitting into the yarnovers two rows down. It blocks quite nicely, and has a different sort of crochet effect. 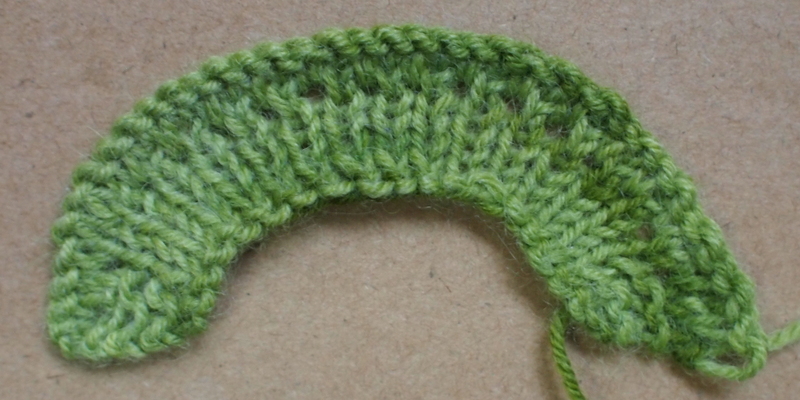 Centering a picot over a single stitch. There are certain kinds of stitch patterns that I like to finish with a picot bind-off, placing the picots so as to emphasize certain parts of the pattern. However, I have sometimes found myself a little frustrated. 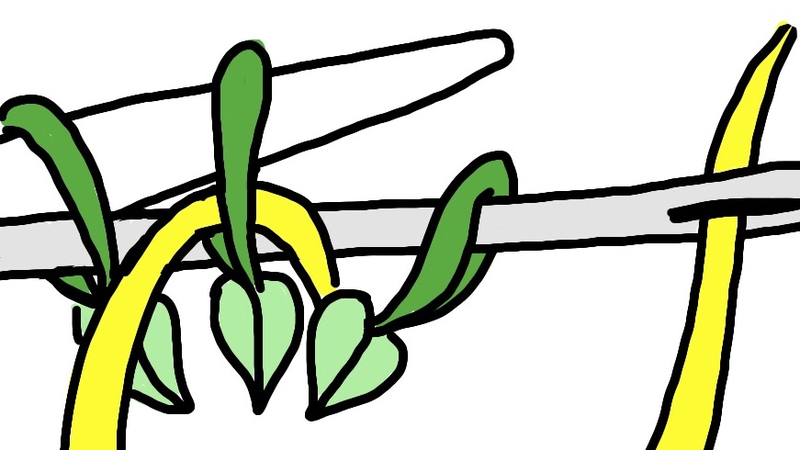 The usual method of creating knitted picots ends up centering the picot over the gap between two stitches. With many of my stitch patterns, this is what I want. But the perfectionist in me doesn’t like this when there’s a single stitch that’s the obvious focal point; in fact, it can sometimes mess up the appearance of the edge. Starting from the right hand side, the first two picots are centered over the gaps between stitches, which looks fine, because there’s not a single stitch at the center of the motif. 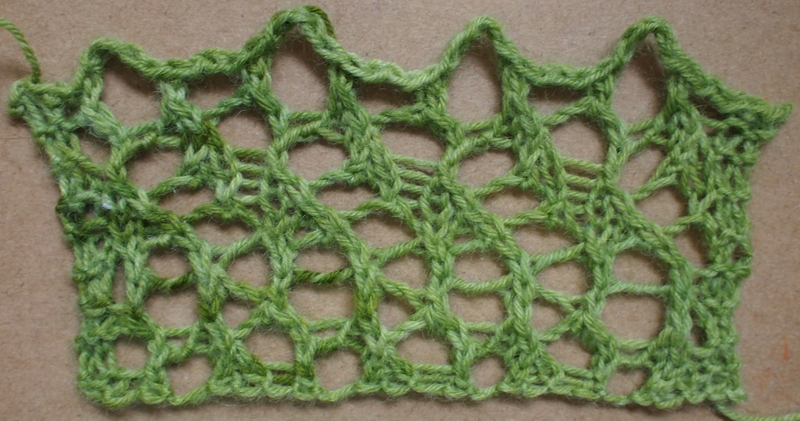 The third picot makes an ugly hole between the decrease and the next stitch. The last two picots use the method I describe below. Despite a lot of new and interesting inventions of bind-offs, my favorite remains the sewn bind-off or backstitch bind-off, as learned from Elizabeth Zimmermann’s writing. It’s stretchy and it looks the same as the longtail cast-on, so it’s good for making the two ends of a piece of knitting match. As many of you know, I tend a bit toward the idiosyncratic. In this case, I prefer what most people think of as the back of this bind-off (and also the back of the longtail cast-on). The texture reminds me of decorative braid. There are lots of instructions out there for the regular sewn bind-off, but I’m not sure if there are specific instructions for the inside-out version. There’s a photo of a tiny swatchlet at the top of this page with the wrong side of the longtail cast-on showing at the bottom and the wrong side of the sewn bind-off at the top. Here’s how it’s done. First, measure out a length of yarn about 3.5 times as long as the knitting is wide, then cut or break it. If you’re working with a really wide piece of knitting, then measure out a length that’s manageable; this bind-off can be done with multiple pieces of yarn, though it does mean more ends to work in. A darning needle is already in play; what’s a few more ends to work in? Thread a yarn or darning needle with the yarn that’s still attached to the knitting. The first and last parts are slightly different when working flat and when working in the round. 1. 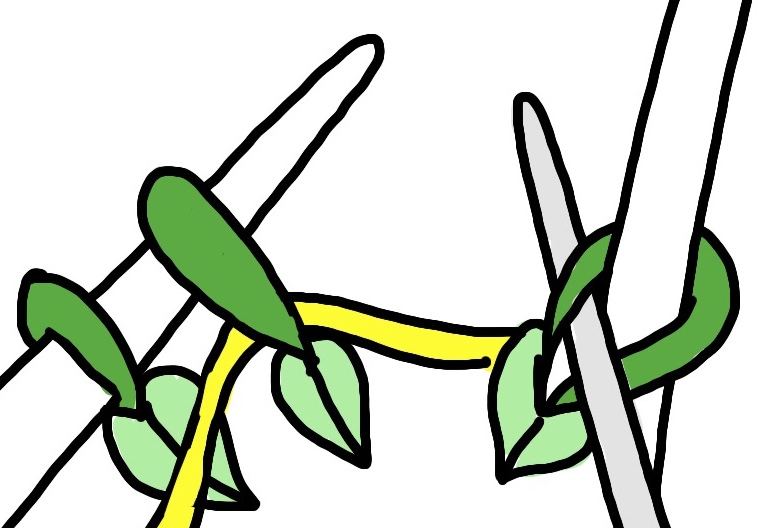 Bring the needle forward through the first stitch of the round. Pull up the slack. 2. Move one stitch to the right and insert the needle through that stitch from front to back (knitwise) but don’t pull it through yet. 3. Skip behind the next stitch to the left and bring the darning needle forward through the next stitch that hasn’t been sewn at all yet. (purlwise) Pull the needle and yarn through. 1. Take the needle behind the first stitch of the row and bring it forward through the second stitch (purlwise). 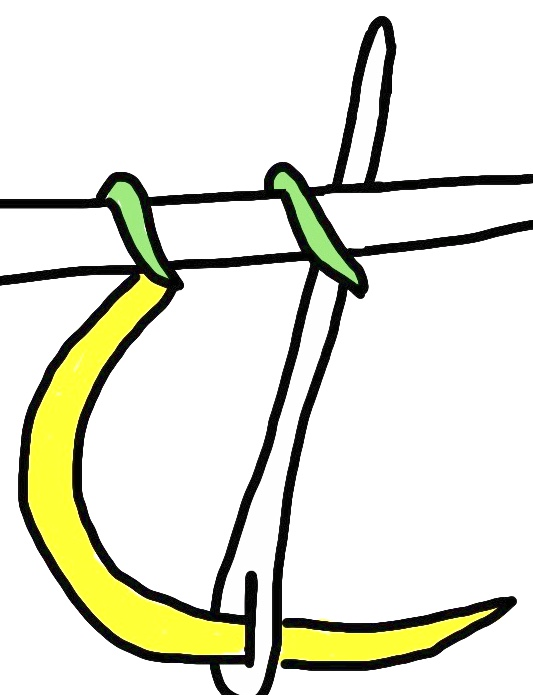 Pull the needle and yarn through. 2. Move one stitch to the right and insert the needle through that stitch from front to back (knitwise) but don’t pull it through yet. 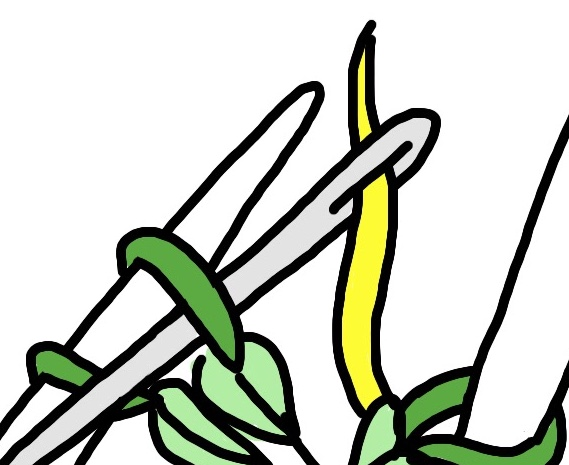 Slip that stitch from the knitting needle to the darning needle. 3. Skip behind the next stitch to the left and bring the darning needle forward through the next stitch that hasn’t been sewn at all yet. (purlwise) Pull the yarn through. 4. Go back one stitch and insert the needle through the first stitch on the knitting needle. 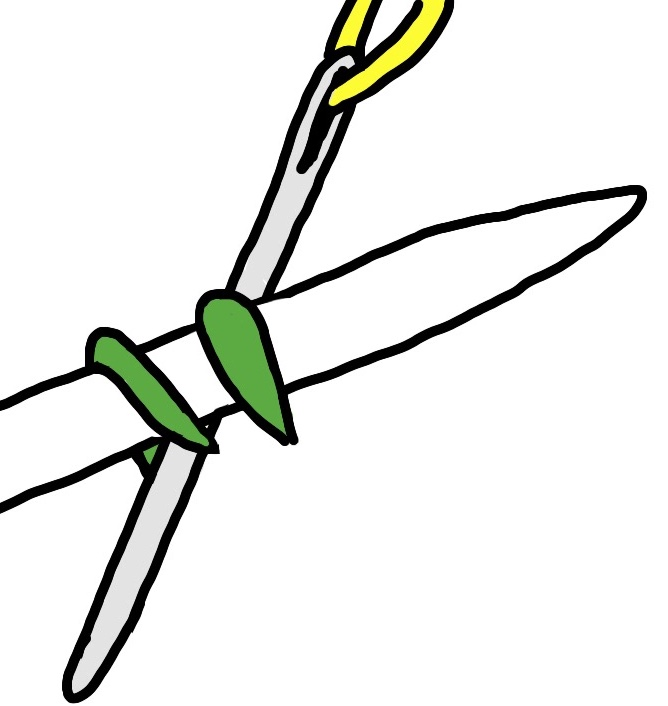 Slide that stitch off the knitting needle before pulling the sewing needle through the rest of the way. Repeat the last two steps until the last stitch of the row or the round. 5a. If working flat, after sliding the next to last stitch off the needle, bring the needle forward through the last stitch one more time. 5b. If working in the round, when all stitches have had the sewing needle pass through twice, the bind-off is done. The last stitch of the round was half-worked at the very beginning of the bind-off. I tend to be a tight knitter, so I find myself surprised by one oddity about the way the sewn bind-off works for me: it’s too loose and a little sloppy. I always have to go back and tighten it up loop by loop so it matches my cast-on. (It’s still plenty stretchy after I do this, so when I say loose, you know it’s excessive.) Your experience might be different, but I’d recommend swatching this the first time you try it to see how it works for you.